When you’re hunting the most dangerous imaginary animals in the world, you need to be prepared for anything! You never know when a saber-toothed crocodile while lunge at you from the bushes, or when a razor-clawed land shark will burst out of the ground. Why, you could come across a rabid yellow-gilled river yeti at any moment during your hunting expedition! That’s why you’d better make sure to bring a complete arsenal of toy guns with you to your next pretend pursuit of dangerous game. It all starts with this hefty toy pistol. 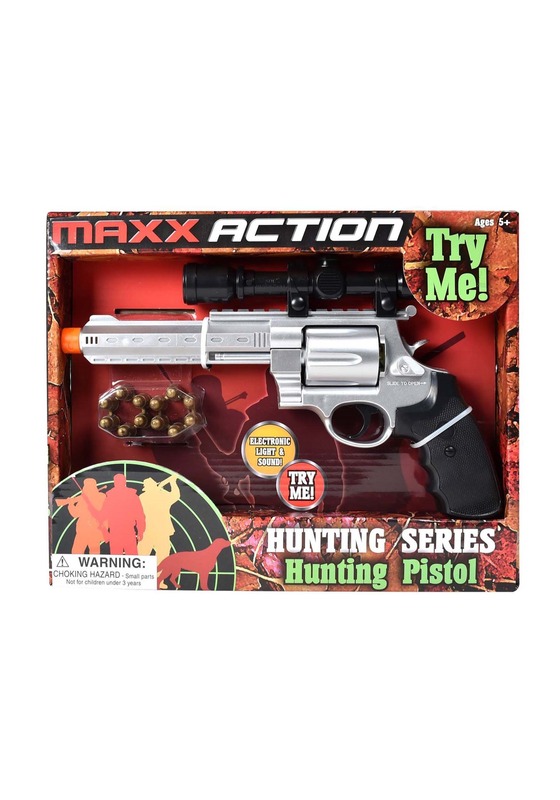 This Maxx Action Hunting Series Pistol with Scope is a toy weapon that’s designed for hunting all of the most dangerous pretend animals in the world. The toy pistol has silver metallic paint job with a black, textured grip. The end of the barrel has a bright orange tip to clearly indicate that it is a toy weapon. It also has a sight attached to the top to help you zero in on dangerous imaginary beasts. It also comes with two ammunition rings, which can be placed inside the revolving chamber of the toy gun. The toy even makes noises when the trigger is pulled.